And when my current crop of students this summer treat me as if I’m an impostor in my own discipline, and that the research and teaching that I do is so not worth their time and tuition dollars, where do we find the grace and the hope to “keep on keeping on,” as Jesse Jackson would say? If I asked them that question, would they be able to answer truthfully before a live American audience? Because most of us who are people of color, we really want to know. We come very close to the brink. And God forbid we exhibit our frustrations with racism, we are immediately labeled “Angry Black Woman” (see this latest Fox News Video – htp Gina from What About Our Daughters). I have given much consideration to being in this black female body and teaching mostly white students in a societal/cultural context in which all of us (people of color and white people) are taught to think in certain ways about certain people. For many of my students, particularly first and second years, I am the first woman of color they have had in any position of authority over them. I make my students uncomfortable. It is part of the journey towards understanding and dismantling oppression. The discomfort is unavoidable and necessary – I believe that it is in those uncomfortable spaces that the most growth takes place – if indeed it will. It is not dissimilar, I think, to the birthing process. I have a midwife friend who has explained to me that the mechanics of birth – that big old baby coming down that little old birth canal, as inefficient and cumbersome as it seems, and by the way as painful as that process can be, it is beneficial to the child in terms of being able to draw that first breath. Now, granted, sometimes things don’t go as planned and birth happens in other ways… for instance, the baby being removed from the mother via cesarean section. And sometimes children come to families in ways other than birth, by foster care or adoption, formal and/or informal. Having experienced all of those ways of building a family, which is an occasion for much joy, I can assure you (along with many other fathers and mothers) that none of them are without pain. Of course students are not the only ones dealing with discomfort/pain; in fact it is not the student’s pain that Anxious focuses on in her post. Rather it is the pain that we as teachers of color bear. How is it that we sustain ourselves – living in a racist, sexist cultural context, teaching about that context and actively working against it, and then dealing with more of the same in the course of the teaching – because the students we teach come from the same context and have learned from that context? The responses from the students are varied, to be sure. Each response demands its own counter response. Each student needs to be taught, and needs to receive the best that I can give them, no matter how they respond to me. Sometimes that is …. really difficult. But I have to be mindful of not coming off as … the Angry Black Woman. I teach in a predominately white school, a small liberal arts college of about 1,000 students. In my class on race and ethnicity, there are usually between 35 and 40 students, which is a large class on our campus. Of those that register for the class, about half are there because it is a requirement for their major, or because it is one among a couple of recommended electives in their discipline. Other students are there because they are genuinely interested in the subject (this is also the case for many of those who are required to take the course, although not for all of them), some are there because they think it is going to be an easy class, and some are there simply because they needed the hours to round out their schedules and this particular class fits. Because of our campus demographics, most of the students are white; I may have 6 or 7 students of color at most. (Of those, there may be only 2 or 3 that are U.S. born, adding to the complexity of talking about racial categories and racism in different cultural contexts.) Many (if not all) of the students in the class will be uncomfortable with the content of the class along the way. I make no apologies for this; there is no way to really deal with the subject matter at hand without a measure of pain and some anger. In fact I make note of these dynamics at the first class meeting, although I’m not sure how many of them hear me when I say these words. I have come to anticipate what the really difficult moments along the way will be. By far, the discussions about whiteness and white privilege bring about the most anger from many of the white students (there are also other reactions, such as sadness and guilt… there usually is a combination of responses). Witnessing the anger of the white students, and often their denial about having privilege subsequently brings out the anger of students of color. Much of the time, the pain and anger the students feel then gets directed towards me. Sometimes the students’ feelings are reflected in my evaluations, so the fallout for me (and others in this situation) is not only psychological and emotional as I deal with students’ reactions, but it also has a potential effect on my ability to make a living in the field that I have chosen. I could teach the subject matter in an objective, distanced, “we are the world kumbaya” sort of manner… well – no, actually I could not do that at all. I am committed to teaching and speaking truth when it comes to something that is literally a matter of life and death for so many people, even in 2008. And so we read about the history of lynching in this country, and why a noose hanging from a tree in the 21st century is not a joke. We talk about whiteness as a political identity, and how the meaning of whiteness and who can be white has changed over the course of the history what has become the United States. And we talk about gender and sexuality and class and physical ability, too, because oppressions intersect and overlap and support and uphold one another. And through it all I have to listen to and teach them all. I can’t just teach the ones who like what I am saying, or the ones who are willing to set aside what they thought they knew about Group X or Person Y, and work at developing a new understanding of reality, or the ones who are willing to bring their own experiences/questions/intellectual curiosity into the classroom. I also have to teach the ones who tell me they will not read an assignment because it does not fit into their belief system; I have to teach the ones who tell me that I have a chip on my shoulder and racism is over because look, I am their teacher; I have to teach the ones that tell me that Muslims are all going to hell anyway, so why should s/he care if they are mistreated; I have to teach the ones that tell me I’m causing racism by talking about race; I have to teach the ones that tell me illegal immigrants and unqualified blacks are taking “their” jobs; I have to teach the ones that tell me that feminism is for man-hating hairy legged women (which, well, sure, but it’s for everybody else, too). And, it is not only the white students who resist the subject matter of the class. Students of color, for a variety of reasons, can and do push back. I should say that some – many – of my students respond positively to the work we do in class, and become or remain active on campus working on these issues. Some have come back to me months, or even a couple of years later to tell me how their thinking has changed, or how something they actively, passionately resisted in class now makes sense to them and makes a difference in their lives. So how do I sustain myself? Many times I’m not so sure. But… there are some things. Belonging to a community of resistance is primary. By community of resistance, I mean that I am in regular contact with people who are committed to doing the work of resisting oppression in all its forms, whether that is teaching, writing, organizing, preaching, working as a community activists, raising anti-racist children, working on immigration reform, etc. These are people that I see on a day-to-day basis or people that I may only get to see once or twice a year. They are people that I know, and people that I know of. They are people whose blogs I read, whose books I read, whose music I listen to. They are people of color and white allies, people from North America and across the globe, men and women, queer and straight, young folks and older ones. Having a broad range of folks to call on means I get to talk to people about this stuff who get it, and helps me maintain perspective – I don’t have to do all the work myself. There are others who have gone before me, there are many who walk with me, and I hope there will be plenty who come along after we get done. As a person of faith, I look to the s/heroes of my faith tradition, and of other traditions to encourage me and to challenge me (that’s why I’m Harriet’s daughter). I try to let myself be guided by that which is unseen and unknown. I believe with all my being, along with Martin Luther King Jr., that the moral arc of the universe is long, but that it bends towards justice. I go out with my girlfriends and we get loud and silly… but sometimes that only comes after we shake our heads and cry. And sometimes I just dance. 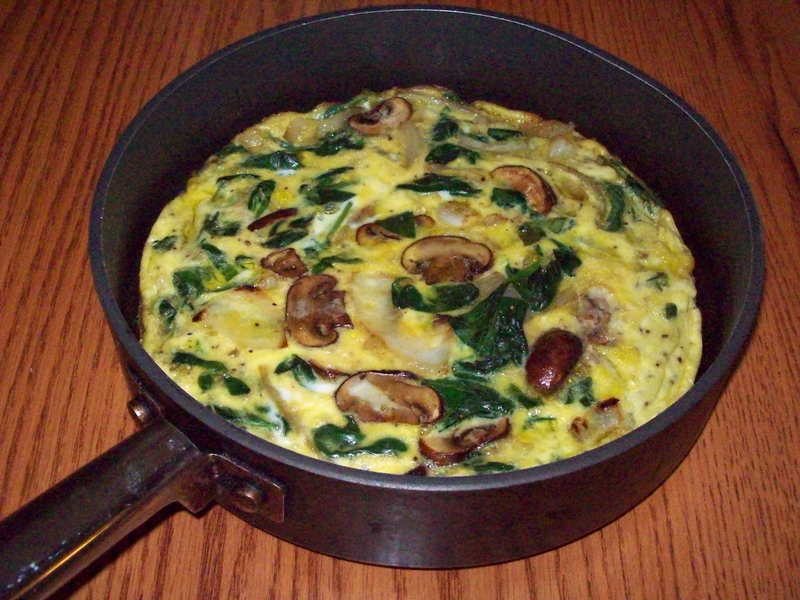 This is the lovely and amazing spinach, mushroom and onion frittata I made for supper tonight.